This country belongs to whomever shows up. And do you know who shows up for every election? Old people. But only 46% of people 18-34 years old voted in the last election. I’ve voted in every election since I was 20 and I’m 66 now. My parents drilled into my head that voting is the most important right a U.S. citizen has and no matter what, it should never be taken for granted. What we’ve learned so far about the Trump presidency. Brilliant, funny, frightening. John Oliver first commented on net neutrality in 2014 here and it was one of the first really popular youTube posts he made. If you’re confused about what Net neutrality is, browse this: Net neutrality on wikipedia. The Trump administration has appointed a new chairman for the FCC, Ajit Pai, who is considering changing the rules put in place during the Obama administration to prevent unfair competition on the internet. Here’s the link John talked about to make logging into the FCC to comment on this easier: http://gofccyourself.com. We’ve been missing John Oliver the past month but he’s back and thank god. In this piece he takes on Donald Trump’s proclivity to exaggerate and lie. It’s brilliant including the ending. 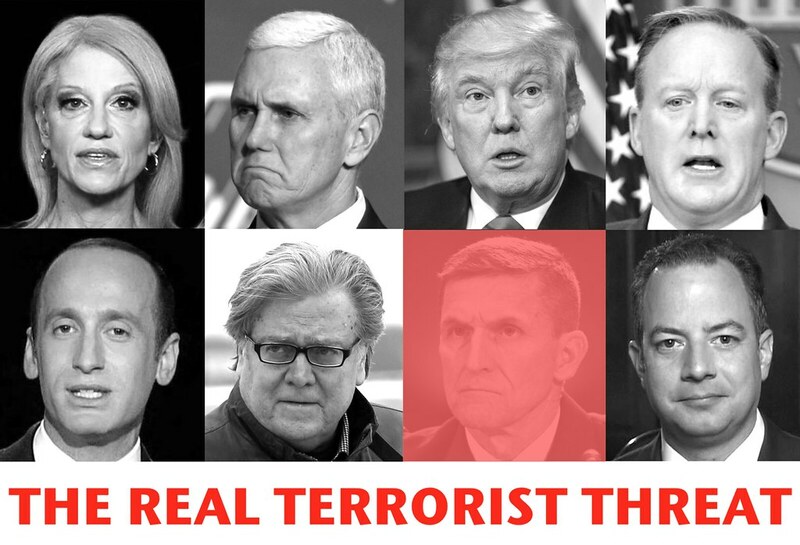 L-R, top to bottom: Kellyanne Conway, Mike Pence, Donald Trump, Sean Spicer, Stephen Miller, Stephen Bannon, Michael Flynn (resigned), and Reince Priebus. There are many more but this has been my protest sign in the marches I’ve taken part in. I’ve heard Julia Hahn is part of the team now, a recruit from Breitbart. Feel free to take this and use it as you like. I’ve been sitting on my hands and not posting political statements to Flickr or my blog but the time has come for any of us who are seriously worried to get to work in any way we can to save our country. I’ve never stopped taking pictures even though my output is low, I’m simply so upset about what’s happening in my country to focus on much else and I’ve been tossing most of the images I take. Being upset has a terrible affect on one’s creative output although for some it can stimulate it. For me it’s led to a lot of sleepless nights. 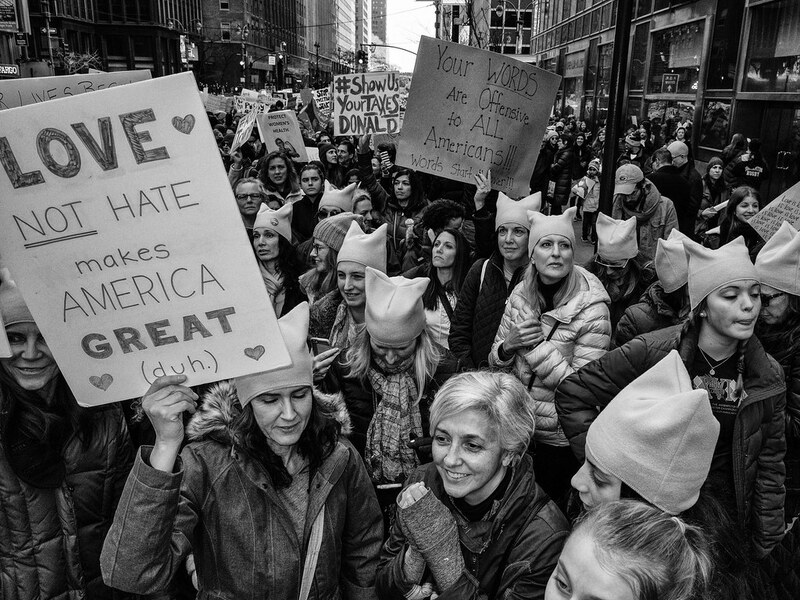 My flickr contact Roy Savoy posted another excellent image taken with his Ricoh GR II at the Women’s March in New York City. The magicians, Penn & Teller Burn a Flag in the White House. This is an outtake from the television series, The West Wing which was on the air from 1999 through 2006. If you watch the entire thing, right up until the end, you’ll understand how a surface understanding of the American bill of rights isn’t enough. It’s brilliant writing by Aaron Sorkin and no doubt others. This outtake is circulating because Donald Trump has stated that Americans who burn the American flag should have their citizenship revoked, stepping on the first amendment of the US Constitution which guarantees the freedom of speech and expression, and the US Supreme Court has stated that that includes flag burning. This has been an interesting and well-studied legal matter my entire life and it came to a head during the Vietnam War protests in the 1960’s and 1970’s. Someone assuming the highest office in the US ought to have at least considered this but it seems that Donald Trump has not, or, if he has, believes that the President can sidestep the US Constitution. These are the kinds of things that are frightening many Americans about our current political situation. President elect Donald Trump has appointed Stephen Bannon as his “senior counselor” (think Karl Rove). Bannon ran Trump’s campaign but many of us hoped the relationship would end if Trump got elected. It obviously hasn’t. Bannon is the chairman of Breitbart News, an ultra right wing organization aligned with the Alt-right movement. All of this to say, Donald Trump has appointed an openly anti-Semitic and racist person to be his closest political advisor. Note: Even though I’m a news junkie and very political, I’ve tried over the many years I’ve been publishing this weblog to keep politics out of it. The fact that I’m posting about our recent US election and Donald Trump in particular has everything to do with the kind of campaign he ran, not his particular policies which we know little about at this point. My grandparents got out of Europe before 1900 but as a Jew I’ve been taught all my life to keep an eye on any politician who uses fear, especially of “foreigners” to drive popularity. Trump is the first politician in my lifetime (I’m 65) who has won an election using this tactic. It may not be the main reason he won, but its at least a part of the many reasons he won. I think it’s important to keep track of this and I plan to, here. I just read this fascinating piece on Medium: Why I “Need” an AR-15 by Jon Stokes and I just finished writing a long comment up on Medium which I’m reposting here with a few edits. I enjoyed reading this piece and while I’m on the “anti-gun” side of the great gun divide, you’ve shown me that if I were a gun owner, I might look into an AR-15. Prelude: I was talked into going out on a deer hunt with a friend and this friend shot a deer (cleanly), walked over to it, said a prayer, then field dressed the animal and we carried what was left back to his barn and I ended up with a lot of venison in my freezer. I get it. If I’m not going to be a vegetarian buying factory raised meat is an odd and hypocritical place to stand as I get worked up about hunters killing deer for food (sport is another matter). I heat my house with wood that I process myself: I get what it’s like to be closer in to the process. That said, you pointed to the idea that the shooter is the issue, not the gun but given current laws (and lack of enforcement) and the NRA’s full court press on all considerations of restrictions, it’s tough to sort that out. This is why I like to think about guns like cars: we already have plenty of experience with testing, licensing, registration and liability insurance and we have a bit more control of drivers and the ability to get bad drivers off the road when they’re caught and the ability to make sure new drivers know the rules of the road and how to control a car. And, it costs more to insure a sports car if you’re 16 or a tractor trailer if you’re any age, it maybe ought to cost more to insure larger caliber or semi-automatic guns. But, I misspeak; we don’t need to insure guns, we need gun owners to carry liability insurance so that if they cause harm, those harmed will get a bit of support and gun owners’ premiums will go up and maybe, if they have enough problems, they’ll lose the ability to have guns. If every gun had to be registered and every gun owner needed a license to own a gun and liability insurance it might put a stop to hoarding arsenals of guns and ammo. Then there’s the argument I don’t make often but is personally meaningful to me: You may have the right to have a gun, but I have the right to live without the fear that you’ll miss and hit me. I live in rural Connecticut and in season, we have deer hunters here. Twice pairs of hunters crossed posted signs on our property (we can see them in winter, no leave on trees) and once, a shot rang out while that person was standing on our property. The first time I put on a bright jacket and walked out and gently reminded the hunters that they’d crossed a posted property line. They were polite and immediately turned around (and crossed into my neighbor’s posted property). The second time, when I heard a shot I immediately called 911 which around here will bring a state police cruiser. The state cop found the hunters about 1/2 mile south of my place on someone else’s property and arrested them for trespassing. I’ve had many Rambo fantasies about: you come on my property with a gun, I’m going to mess you up. When I was 13 we went to visit some relatives in Palm Springs, California. I found myself walking down a street with a cousin I’d never met before. We were on our way up into the hills to, I thought, explore and climb around. My cousin said he had to stop at a friend’s house for a second and I waited in the street. I noticed that a kid our age came to the door, then that kid’s mother, and then my cousin returned and we continued on. About 2 minutes later there was a large explosion and I found myself on my back with blood squirting out of various places on my body. I could see bones in my right arm and it was smoking near the elbow. My left wrist was squirting blood like a geyser. The right side of my t-shirt was burnt and blood soaked. I looked up and my cousin was also on the ground with his right hand blown off, his left hand mangled and his face a total mess and blood was squirting out of him as well. I got up and dragged my cousin by his shirt to the nearest house and pounded on the door. A woman came to the door and immediately fainted and clonked her head on the tile floor. The husband saw all of this and slammed the door. I passed out in the bushes next to the door. The fire department came and picked up my cousin and rushed him to the hospital. They didn’t see me in the bushes. A bit later, the police found the blood trail and me in the bushes and rushed me to the hospital. Both of us almost died, although he was far worse off than me. A year later, after many operations both of us had survived although him without a hand and only a piece of his other and a rebuilt face, me with shrapnel in my arms and side, a broken nerve that never healed right and scars all over my body. I’m 64 now so that memory is mixed in with plenty of others but it was and remains a powerful experience in my life. Less because I almost died, more because the reason I almost died was not because I was messing around with explosives and made a mistake, but because I had the misfortune to be standing next to someone else who was. The boy who my cousin had interacted with had sold him a small, glass jar of black powder and the mother had made change in the transaction. They never discovered what triggered the explosion but it was a hot day, who knows? Later it was discovered that the “gun family” had a lot of legal and illegal guns and associated stuff in their basement and because the mother had made change in the transaction they were sued by us to cover our medical expenses and a bit more. But, winning that suit did not erase the memory from my mind that my cousin, who frankly I didn’t know before that day got us both blown up. So, I won’t be shooting off fireworks this 4th of July. And, I’m generally pretty careful about hanging out with folks who mess with fireworks or firearms. I used to do a lot of traveling for a living and once Arizona started having open carry, I stopped taking jobs there. Yes, you have a right to own a gun, but I have a right to be safe (from your mistakes) in my home and I would argue, in my country. I did some writing on this earlier: Liability insurance as a form of gun control.